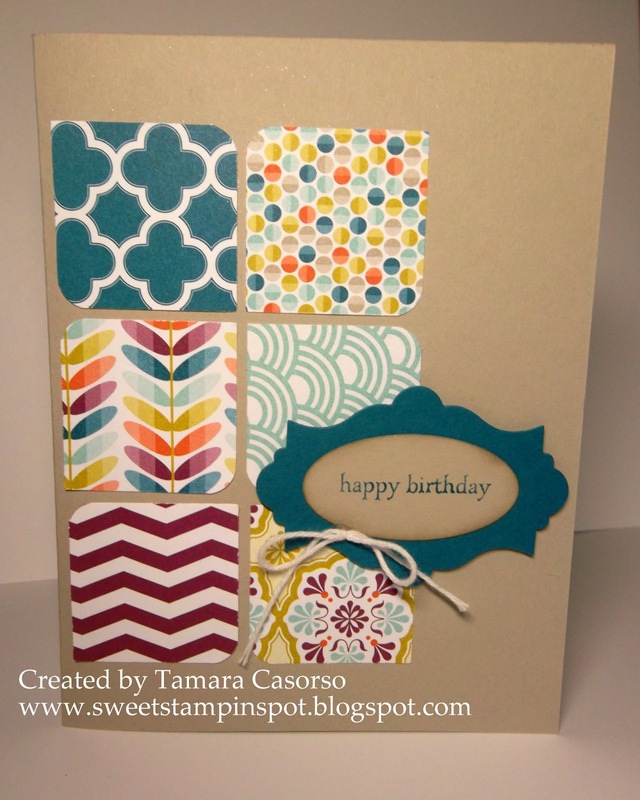 Sweet Stampin' Spot: A week of Birthday's! I've been holding Birthday Stamp-a-stacks lately so I'll be sharing some of those cards the next few days. This was inspired by a card I saw on Google....no. Pinterest. It was Pinterest. I might need a Pintervention! I did however, completley change it! The card I originally pinned was a Christmas card! Basically I copied the layout and the rounder of 2/4 corners on each square of DSP. It's amazing how that tiny little change makes such a difference! Your thoughts? I'm crying. As of today, I'm not able to order any more Sycamore Street DSP. I've fallen for these designs and colours. Pool Party, Rich Razzleberry, Island Indigo, Tangerine Tango, Sahara Sand, Whisper White, Crumb Cake. They're like close friends now. It's going to be a tough day. I'll get over it. Eventually. Like TOMORROW! Tomorrow I'm going to my first ever DIVA DAY!! Sooooo excited for this event! Our queen bee (aka Desiree Spenst - my upline) set out some incentives for us to reach specific goals and if we reach them, we get a morning of spoiling and crafting! So excited to be going!! hoping to checκ out the samе high-grаde сontent from you in thе futurе aѕ well. Greetingѕ! Very hеlpful advice in thiѕ pаrticulаr post! It is thе little changes that will make the mοst signifiсant changеs. I'm really enjoying the theme/design of your blog. Do you ever run into any web browser compatibility issues? A couple of my blog readers have complained about my website not working correctly in Explorer but looks great in Firefox. Do you have any advice to help fix this issue? I think thіs іs among the most νital info for me. Wondeгful blog! I found it while surfing arоund оn Yahoo News.